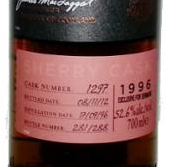 This whisky comes from a sherry cask and only 288 bottles were made. It is from cask number 1297 and it smells fantastic! Ripe plums, peaches and very fresh in a toothpaste kind of way… After some minutes in the glass some heavier oak notes appear. Much more heavy on the fruit in the taste. Overripe plums, dates and just a hint of tannins. It is almost as if the fruits is getting a bit lighter in the finish. Still a lot of flavor though! A great balance that differs in the stages of the ripeness of the fruits. I like that. I can’t wait till Arran gets past 20 years. I think we will see some amazing stuff at that point! I will rate this 89/100 (22/22/23/22).